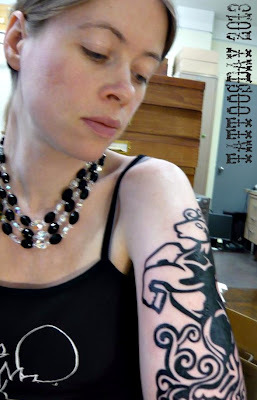 As many of you who have followed Tattoosday over the years, April is a special month here, where we feature, in honor of National Poetry Month, thirty days of tattooed poets. It is astonishing to me that what I dreamed up in 2009 is now entering its fifth installment. When I first reached out to Stacey Harwood at the Best American Poetry blog and asked if she and David Lehman would help promote the idea on their site, I worried that I would be able to find enough poets willing to participate. I didn't doubt the existence of tattooed verse-slingers, I just wondered if they'd be interested in sharing with a fledgling tattoo blog. Fortunately for me, and for you, Dear Readers, my doubts were quickly dashed and this year, it looked as if we were going to have too many poets. Is there such a thing? A nasty case of unemployment has left me with extra time to prepare the month so, on this March 31, I have pretty much prepared and scheduled the entire month. I do expect to be busy with stragglers to whom I had granted spots, and will now find themselves as part of double days of tattooed poets. In general, posts will go up in the wee hours of the morning and, if there are two poet days, they will go live in the afternoon. I can't begin to name everyone who has helped with this endeavor over the years, but I thank you for reading, and ask you to enjoy the month of April and the wide range of poets from all over the U.S. who will be seen here, in the flesh, and in the written line. We were recently honored in a post over on Boar Skull, a site that sells plugs, body jewelry and organics. We made their list of "Six Tattoo and Body Modification Blogs You Should be Reading". I'm sure the six are not in any particular order, but we're #2 and, anytime Tattoosday is spoken in the same breath with the good people over at Needles & Sins, we're in damn fine company. Hold on to your tattoo-loving hats, people. Spring is in the air, and the Tattooed Poets Project, Volume V, is a week away! Way back in January 2012, I was reading an article in The New York Times called "Continuing Education, At the Bar" which reported on the growing popularity of educational events in NYC watering holes, citing "The Secret Science Club" as one of the more popular of these phenomena. The club's Carnivorous Nights annual Taxidermy Contest was the event that really stood out, and the Times article was accompanied by a slide show, featuring club members posing with their contest entries. 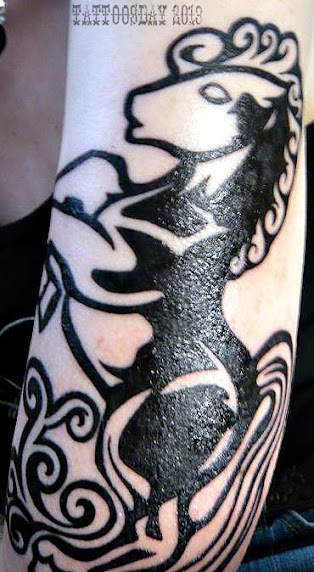 Several participants were sporting tattoos. As it was January, a "slow" time of year for Tattoosday, I thought it would be cool to perhaps reach out to some of these individuals and see if anyone might be interested. It could be a new series of sorts, say "Inkspotting in the Media," for lack of a better term. I noticed she had a tattoo on her arm and, well, she looked pretty cool, so I found her on Facebook, and sent her a message inviting her to be on Tattoosday. I didn't hear back from her until eight months later, last September, with a note apologizing that it took so long to respond, but my message had been delegated to one of Facebook's sub-folders. 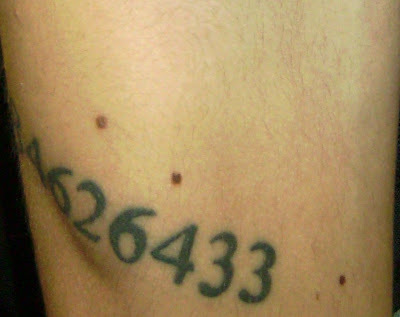 To make a long story longer, the passed time had addled my memory, and I thought Daisy was a straggling tattooed poet, who was responding to one of my inquiries for the Tattooed Poets Project, for which I send out numerous inquiries every year. I politely told her I would reach out to her in the winter, when I started working on the following April's installment. "I saw a lamp in the window of Housing Works, snapped a photo through the grate (they were closed and the items in the window were to be sold upon store opening) and sent it to my good friend Nathan Burke. He drew it as a tattoo, and my boyfriend at the time fine-tuned it before I took it to Annie [Lloyd] and Three Kings Tattoo [in Brooklyn]." "I am an Insect Preparator at the American Museum of Natural History. I love insect jewelry because it showcases nature's beauty and bounty -- and I feel good about using beetles that were farm raised instead of harvested wild. This way they get to live their full lives in peace and then live on as exquisite adornments in loving homes. In addition, I have the pleasure of being a yearly entrant and award-winner in the Carnivorous Nights Brooklyn Taxidermy Contest, where in years past I have displayed many ridiculous and whimsical items ranging from beetle dioramas to antique fur coat sculptures to jewelry." And a piece in The Wall Street Journal online. And this post which has a photo of one of Daisy's dioramas. Thanks to Daisy Tainton for sharing her tattoo and introducing us to the art of competitive taxidermy! I previously wrote about meeting Javie Dev, one of the artists at Ace of Hearts Tattoo in San Pedro, along with Vanessa, the shop piercer. He credited the top image in this sleeve to his mentor, Guillermo Figueroa, who works out of Tinta Maldita Tattoo Shop in nearby Wilington, CA. The middle image, of Leatherface from The Texas Chainsaw Massacre, is credited to "the world famous Diablo," a.k.a. Edgar Marquez, who is owner of Long Beach Ink Assassins. And the bottom piece of the sleeve, the iconic hockey mask belonging to Jason of Friday the 13th fame, was inked by Oscar's friend Irving Lozano, who works out of Addinktion Art Gallery and Tattoos in Los Angeles. Thanks to Oscar for sharing his work with us here on Tattoosday! Labels: 808 Tattoo Studio, gecko, Hawai'i, Hawaiian, lauhala, Orchids, Tattoosday Goes to L.A.
As promised, we drew two winners from those of you who entered the giveaway we were running with freestyleXtreme.com! Congrats to Linda B. and Gina! Thanks to the good people at freestyleXtreme.com for partnering with us in this promotion! Friend Brian Grosz appeared on Fox 411 on Tuesday (February 12) here. As a contributor writer for Needles and Sins, Brian chimed in on the subject at hand, "Are Reality TV and Pro Sports Helping Tattoos Go Mainstream?" [Note: I meant to post that two weekends ago when I was in Los Angeles, but it never went live. Better late than never....]. People who follow UFC should know who Ronda Rousey is. Last weekend she made history by defending her title as the first UFC Women's Bantamweight champion (as reported here, among many places). Why do I even care? 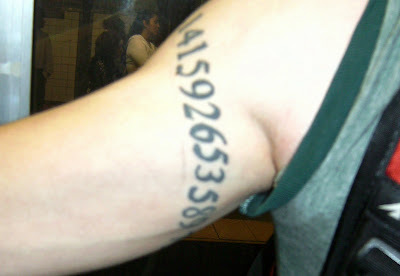 We here at Tattoosday are fans, ever since meeting Ronda in Penn Station and interviewing her about her Olympic-inspired ink (here) back in 2009. Congrats Ronda! One of my friends from college alerted me to this interview of Baba Austin, at Vintage Tattoo Art Parlor. The interviewer is senior at my alma mater, Occidental College, which is in close proximity to the Highland Park neighborhood where the shop is located. Last week I was headed back to New York from L.A. when I met Stephanie out near my gate at LAX. Stephanie is originally from Philadelphia, but she got this as a ten-year anniversary gift commemorating a decade of living on the West Coast. 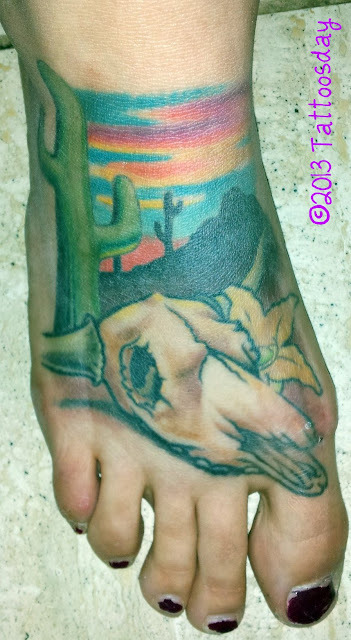 She credited this colorful Southwestern tattoo, complete with cacti and animal skull, to Cameron Chase at Tat-Fu Tattoo in Flagstaff, Arizona. 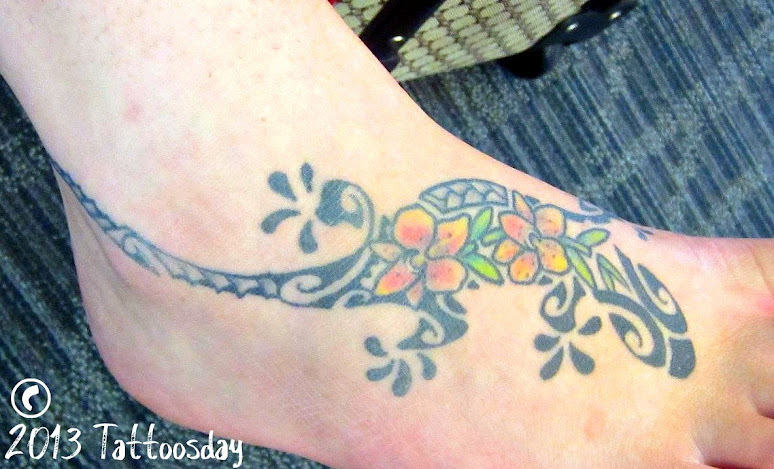 Thanks to Stephanie for sharing her colorful anniversary tattoo with us here on Tattoosday! Labels: Animal Skulls, Cactus, flowers, Skulls, Southwest, Tat-Fu Tattoo, Tattoosday Goes to L.A.